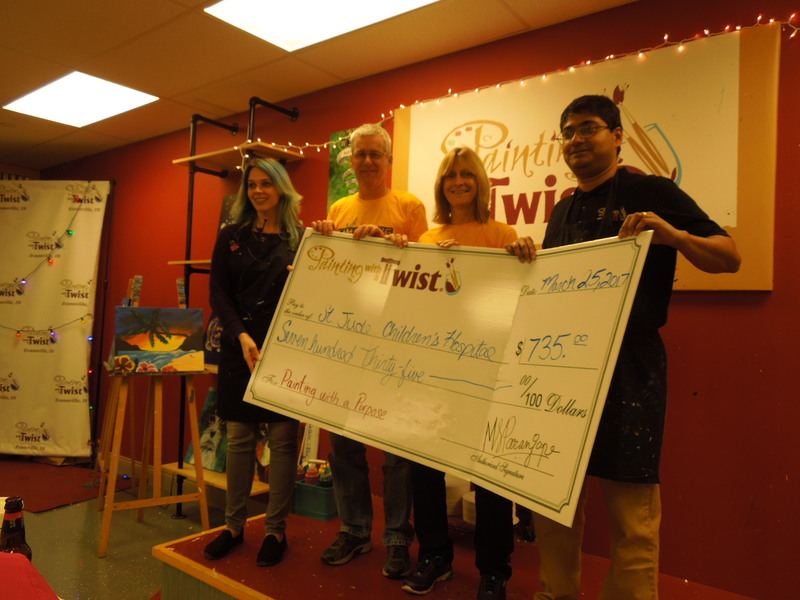 Thank you to Painting With A Twist for hosting our 2017 Painting With A Purpose fundraiser for St. Jude. We had a great time raising money for a wonderful cause! 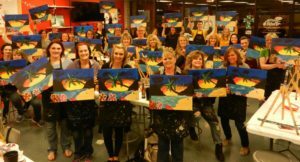 This year’s painting — a beach scene — was inspired by Sam’s love of the beach and our memories of wonderful family vacations. Thanks to everyone who came. Your support means a lot to our family and to the kids of St. Jude. A talented bunch of St. Jude supporters! For the third year, SamStrong was well represented at the St. Jude Memphis Marathon Weekend. Andy, Tammy, Susan, Evan, Dan, and Patty all participated in the 5k and all did very well! Overall, the weekend was a huge success, with over 23,000 total participants raising $10 million. Especially inspiring was the portion of the run that went through the St. Jude campus, where the street was lined by St. Jude doctors, nurses, patients, and families. This year’s SamStrong Childhood Cancer Awareness Football Game on Friday September 9 had the largest crowd since the event started! Mayor Lloyd Winnecke issued a proclamation declaring September 9, 2016 as Childhood Cancer Awareness Day in Evansville. A huge “Thank you!” to the students, faculty, and parents at Memorial High School and St. John the Baptist School for keeping the spirit of SamStrong alive and for purchasing and continued wearing of your SamStrong shirts. Special thanks to the SamStrong Club for organizing the very successful tailgate party. The students and faculty at Mater Dei High School also deserve thanks for joining with Memorial to help defeat childhood cancer. Mater Dei students and cheerleaders joined us in Going Gold! The Memorial High School Community is “Going Gold” in recognition of Childhood Cancer Awareness Month. Memorial’s home football game against Mater Dei on Friday, September 9 is the Fourth Annual SamStrong Childhood Cancer Awareness football game. SamStrong carries on the final mission of Memorial Class of 2012 graduate, Sam Featherstone, to raise awareness of childhood cancer and money for much needed research. Sam, a life-long member of St. John the Baptist Parish in Newburgh, died on January 2, 2013 after battling brain cancer for over 3 years. Everyone attending the game on September 9 is encouraged to wear gold to show their support of this important awareness event. Gold SamStrong Tshirts with the powerful message of Philippians 4:13, “I can do all things through Christ who strengthens me” printed around one of Sam’s drawings showing the defeat of the cancer monster will be available for purchase at the game or can be ordered at this link. Short sleeve shirts are $10 and long sleeve are $15. Order forms can be sent to SamStrong, P.O. Box 252, Newburgh, IN 47629-0252. The money raised by SamStrong is used only for research at St. Jude Children’s Research Hospital. If you would like to learn more about Sam and SamStrong, please visit www.samstrong.org. Before age 20, 1 in 285 kids will receive a cancer diagnosis. Cancer kills more kids than all other diseases combined. Every day, 46 children in the United Sates are diagnosed with cancer and every day, 7 children die from cancer. Here are some pictures from the 2015 SamStrong tailgate party and football game. SamStrong was well represented in the 2014 St. Jude Memphis Marathon/Half Marathon/5k. Dave Keller ran the marathon. Mark Ray and Chris Ray ran the half marathon. In the 5k were Dan and Patty Rucker, Kyle and Martha Willis, Andy, Tammy, and Susan Featherstone, and Evan Daily. All participants were cheered on by Jeri, Emmaline, and Elliete Ray. It was a very inspiring event, with over 18,000 total participants raising $7.5 million. Especially inspiring was the portion of the run that went through the St. Jude campus, where the street was lined by St. Jude doctors, nurses, patients, and families. Evan, Susan, Tammy, and Andy. Entering the St. Jude campus. Rick Shadyac at the pasta party. The St. Jude Hero’s pace truck. Andy and Tammy on the pace truck. Dave Keller with Elvis and an Elvis impersonator.